As summer ends and we move into colder months, here are my top tips for winter training and some of the ways to stay motivated throughout the shorter days and colder months. When its dark, cold and wet – opt for the turbo trainer. This means that you can maintain winter training levels inside which of course is more practical. The turbo trainer can however be a laborious machine and no one enjoys pounding out endless pointless miles on the turbo trainer. Try to make it more positive by working to either music or training videos to liven things up. I’m not a fan of Zwift, but for many it works well and if it helps keep you riding and getting the miles in then great! I think have a plan to work to as well and that way you can work to improve certain areas, there is lots of material online about interval training and sessions to run on the turbo. There are local classes dotted around all over the place which you could plan into your week to get a session done. Wattbike classes for example can offer an indoor training session on a bike which measures your power output, pedalling technique and heart rate. With regular sessions you can monitor you’re progress and then put the benefits from winter training to use on the roads and trails come the summer time. Spin classes at the gym also can offer a good interval session too. I’m a road rider primarily, but this winter I’m really looking forward to doing some mountain biking and cyclocross. It’s a great chance to get do something different. I can ride a mountain bike throughout winter even when the temperatures drop more and the roads are icy and dangerous. Cross training is good for fitness, and it’s also good fun to try something new as well. Mountain biking or cyclocross are brilliant but also swimming, running, badminton or anything just to stay active and enjoy what you’re doing. 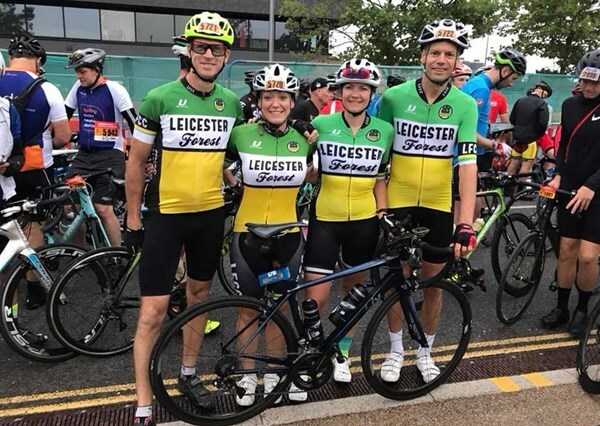 As a member of Leicester Forest CC we have club runs each week, riding in a group really helps in the cold and windy weather by having teammates to share the work with. Get in the longer miles at a steady pace, ride out to a nice café stop or town, and explore new places or push yourself riding with stronger riders to get more of a workout. Its important to find the right group for you, try a few club rides before joining. Whatever your ability there will be others that are similar. Over winter when the days are shorter and its cold and miserable outside I think it’s important to be really organised. If you’re riding before or after work, have everything ready the night before if you can. My slow cooker is also my best friend in winter as you can have something cooking all day with no need to waste valuable training time. A little pre planning when you have a little more time goes a long way rather than constantly chasing your tail trying to get on the bike! Commuting is a good way to take advantage of the shorter days if a commute is workable for you. It isn’t possible for everyone, but if it is then take full advantage of that to get the additional miles in. I think if you have a goal to work towards it really helps you stay motivated. Knowing that putting in the winter training is going to benefit me is one of the ways I kept it going through winter when I quite easily could have spent all my spare time in my pyjamas, fleecy socks and fluffy blanket! Last year I trained with a great group of women from my cycling club and we spent one evening a week riding on the Leicester Cycle Circuit which is flood lit with the aim of entering a local team time trial. We also practiced cornering, sprinting, race tactics and just general group riding. It made for some great training sessions and we smashed the TTT come Spring! Investing in some decent kit can help you keep going over winter and make the experience much more enjoyable. Last year buying decent over shoes, gloves and a Castelli Gabba were items that kept me cycling through winter time. I have added a few more items to my winter kit list this year too. Look for wind proof items that really help when it gets colder. Good lights are equally important, worth investing in a good set! Overtraining is not productive. Everyone is different and I really would advise listening to your body when it needs to rest. If you have a cold or are feeling tired, then rest until you’re feeling on better form. I have made the mistake of riding constantly through colds and I think this just dragged everything out. Strava isn’t for everyone and I can understand that, but personally I find it a great tool for motivation for training year round. It’s a great way to keep track of what I’m doing, to keep my mileage up, support, encourage and post lovely photos of the places I have been to. You can join the Rutland Cycling Strava club here.